At long last, contracts are being sent out, contracts are being signed and sent back in, and the initial stages of constructing the 2019 York Revolution roster are starting to take shape. So this, Revs fans, is your alert: tune in this Tuesday, February 5 at 6 p.m. for the season premiere of Revs Hot Stove Weekly presented by Shipley Energy as the first player signings of the season will be unveiled live on SportsRadio 1350 WOYK! Revs manager Mark Mason will once again join the program live by phone with Revs broadcasters Darrell Henry and Brett Pietrzak. Three player signings will be announced live on the first episode along with a look back at what has transpired around the league during an interesting off-season to this point. Player interviews are also planned throughout the 10-week, 10-episode series which runs through mid-April when the team gathers for the start of Atlantic League Spring Training. The show can also be heard live online at woyk1350.com or via “The New WOYK” app. Revs Hot Stove Weekly presented by Shipley Energy will air Tuesdays at 6 p.m. during the first three weeks of February before moving to 6:30 p.m. on Tuesday, February 26th when The Baltimore Baseball Show hosted by Dan Connolly, senior writer for The Athletic Baltimore, returns for the 2019 season. At that point, The Baltimore Baseball Show will air at 6 p.m., followed by Revs Hot Stove Weekly at 6:30 p.m. as part of WOYK’s big baseball Tuesday through the month of March. That schedule will remain in place until the end of March when The Baltimore Baseball Show shifts to Mondays to coincide with the start of the Major League Baseball regular season. For now, there are a few other items to cover, beginning with some additional coaching news involving Revs alumni. We mentioned on our previous blog post how Vince Harrison and Keoni DeRenne have both advanced their coaching careers with Harrison taking over as manager of the Arizona Diamondbacks’ Class-A affiliate Kane County, and DeRenne joining the Chicago Cubs organization as hitting coach at Triple-A Iowa. We are proud to also pass along the news that two more former Revs are moving up the coaching ladder as well. Former Revs catcher Salvador Paniagua has been promoted to assistant hitting coach with Double-A Altoona in the Pittsburgh Pirates system, ironically the position formerly held by DeRenne. Meanwhile, former Revs infielder Liu Rodriguez has been promoted to manager of the Milwaukee Brewers’ rookie-ball club in the Arizona League. That makes four former Revs to hold managerial positions at the professional level as Harrison has just begun his managerial career, DeRenne managed the Pirates’ Dominican Summer League affiliate in 2013, and former York first baseman Chad Tracy managed for three seasons in the L.A. Angels farm system before transitioning to Field Coordinator for the Angels last year. Certainly proud news for us to share and we send our congratulations to all of them! Last item of business on this post – a quick update on the winter ball scene as the Caribbean Series is set to begin on Monday. Unfortunately, the series has been moved to Rod Carew Stadium in Panama City, Panama due to political unrest in Venezuela. We certainly hope the series and travels go safely for all involved. As always, lots of Atlantic League names dot these rosters, but we’ll focus on Revs connections. Estrellas de Oriente will represent the Dominican Winter League as league champions, thus earning the Caribbean Series berth. RHP Jailen Peguero (York ’18) was in their bullpen earlier in the winter season, going 1-1 with a 3.75 ERA in 26 outings. C/1B Isaias Tejeda, OF Alfredo Marte (York ‘16), and RHP Josh Judy (York ’13, ’15) all briefly played for Aguilas Cibaenas (as did 45-year-old Bartolo Colon who made two starts). Alexi Casilla hit .318 for Toros del Este which also briefly employed C Luis Cruz, RHP Waldis Joaquin (York ’17), and former MLB All-Star Hunter Pence. LHP Edward Paredes (York ’13-15) who saw his first MLB action with the Dodgers the last two seasons had a great winter campaign with Leones del Escogido, compiling a 1.15 ERA in 27 outings of situational relief, allowing just two runs on six hits in 15.2 innings. LHP Leyson Septimo (York ‘15) appeared in 10 games for Tigres del Licey. Cardenales de Lara is the Venezuelan Winter League champion, heading to the Caribbean Series. Former Revs starter Jorge Martinez went 5-3 with a 2.26 ERA in 12 starts for the champs, while Ricardo Gomez posted a 2.92 ERA in 25 relief outings. Atlantic League closers Ryan Kelly (Somerset) and Felipe Paulino (Sugar Land) are teammates. OF Jose Tabata who played in just seven games for York this past season bounced back by batting .295 for Aguilas de Zulia and Tigres de Aragua. This well test Revs fans’ memories… RHP Victor Garate? He appeared in one game for York in 2012 so we’ll forgive if the name doesn’t ring a bell. He appeared in 15 games for Aguilas. RHP Junior Rincon allowed just two runs in seven innings for Caribes de Anzoategui; also of note, longtime Southern Maryland RHP Daryl Thompson made 13 starts for that club (2-5, 5.66) coming back from a 2018 season that saw him miss time with a broken jaw after being hit by a line drive. Isaias Tejeda batted .306 with four homers for Leones del Caracas. Former Revs OF Alfredo Marte (mentioned previously for his stint in the DR) hit .271 for Navegantes del Magallanes where former Revs RHP Zack Segovia (York ’13) appeared in 10 games (0-0, 3.60) for that club. LHP Robert Carson appeared in three games for Bravos de Margarita before heading to Mexico. RHP Anthony Lerew (York ’14-15) made a successful comeback to the game for Tiburones de La Guaira, going just 2-6 but posting a solid 3.95 ERA in 11 outings (9 starts). Charros de Jalisco won the Mexican League title. RHP Grant Sides was a big factor, going 1-0 with a 1.17 ERA and six saves in a dominant 13 outings. OF Melky Mesa spent time with Aguilas de Mexicali, batting just .159 in 13 games. OF/2B Alonzo Harris had a terrific winter for Mayos de Navojoa, batting .302 with 7 home runs and 28 stolen bases in 66 games. Telvin Nash and Robert Carson joined Harris for time with Navojoa as well. Former Atlantic League batting champ OF Justin Greene (York ’14) has been a fixture in Mexico since his one season in York and batted .232 in 18 games for Venados de Mazatlan. RHP Manny Corpas (York ’16-17) was Greene’s teammate with Mazatlan as well as pitching for Yaquis de Obregon, going 0-3 despite a 3.81 ERA in 28 outings. LHP Nate Reed (York ’16) went 3-4 with a 3.67 in 11 starts for Obregon; RHP Joe Van Meter also made one start. Cangrejeros de Santurce took home the title in Puerto Rico. RHP James Pugliese made three scoreless appearances – the Revs have dealt Pugliese to the Somerset Patriots for the upcoming season so that he can attend school close to home in New Jersey while continuing his baseball career. OF Dayron Varona (York ’17) hit .184 for Criollos de Caguas. LHP Chase Huchingson (York ’17) went 0-3 with a 4.50 ERA in 18 outings for Caguas. LHP Logan Williamson made three starts, and LHP Javier Machuca, a most-obscure Revs name from the past after making one appearance during somewhat of a tryout in 2015, appeared in seven games. LHP Jonathan Sanchez successfully returned from a shortened stint with the Revs due to some midseason soreness, going 1-1 with a 3.72 ERA in 7 starts for Indios de Mayaguez. Segovia made one start for that club in addition to his time in Venezuela. In addition to those four leagues, champions from leagues in Cuba and Panama will round out the six-team field in the Caribbean Series next week. Lastly, some former Revs went to the outback for their winter assignments. INF Mikey Reynolds (York ’15) batted .366 in 28 games for the Adelaide Bite of the Australian Baseball League. 3B/1B Zach Wilson (York ’18) rebounded to hit .331 with 12 homers for the Canberra Cavalry where LHP Frank Gailey was once again one of the aces, going 5-2 with a 3.10 ERA in 10 starts. LHP Luke Westphal took on a starting role with the Melbourne Aces going 2-3 with a 3.70 ERA in 9 starts. One teammate’s name that needs mentioned is RHP Byung-Hyun Kim, the once-great closer for the Arizona Diamondbacks who last pitched in the Majors in 2007 and recently turned 40. RHP Ty’Relle Harris had a great season for the Sydney Blue Sox, going 4-0 with a 0.87 ERA in 15 outings (20.2 IP, 7 hits, 2 runs, 6 walks, 31 strike outs). That’s all for now. If you’re like us here at the Revs and WOYK, you’ve been itching for some 2019 team news, and once again we’ll have it for you on a weekly basis beginning this Tuesday night! 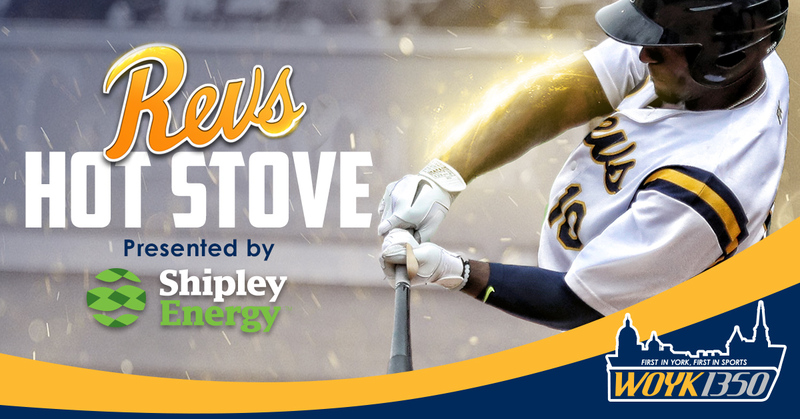 Darrell, Brett, and Mase will talk to you at 6 p.m. for the season premiere of Revs Hot Stove Weekly presented by Shipley Energy on SportsRadio 1350 WOYK. This entry was posted on January 30, 2019 by blogtoblogchamps. It was filed under Alumni Update, Player News, Team News .